If you have a vegetable garden, don’t exclude a vegetable like broccoli (Brassica oleracea) because growing broccoli isn’t all that difficult. Let’s take a look at how to grow broccoli in your garden. Broccoli transplants can grow in six to eight weeks for a summer crop and only five to six weeks for a fall crop. When growing transplants in the spring, give them enough cold weather to harden off, but make sure they are protected from freezing temperatures. 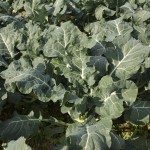 Broccoli grows best in the cooler season and prefers temperatures between 65 and 75 F. (18-24 C.), so this is a good rule of thumb when trying to figure out when to plant broccoli. When planting broccoli in the spring, allow plenty of time to harvest the broccoli before the weather becomes too hot. As far as broccoli growing tips go, make sure the rows are 3 feet apart (.91 m.), with the plants about 2 feet (60 cm.) apart. Growing broccoli is done best in soils that are well-drained with a texture between sandy and clay loam. Make sure the soil pH is between 5.8 and 6.5. Broccoli plants require lots of sunshine for the most part, but these are forgiving plants and will also tolerate partially shaded locations of the garden, which is nice for those lacking full sun. One of the best broccoli growing tips is to provide a uniform water supply to your plants. You should water the garden in the morning so the foliage is dry before the sun goes down. Make sure you water the broccoli enough to moisten the soil to a depth of at least 6 inches (15 cm.). If you only sprinkle the plants lightly, your broccoli will have shallow roots and not get the nutrients it needs to provide you with a good crop. Broccoli is usually ready to pick 65 to 70 days after planting. Pick the broccoli when the heads are 3 to 6 inches (7.6 to 15 cm.) around. To harvest, just cut the main stem of the broccoli about 6 inches below the head. Depending on the variety you planted, you may get some secondary smaller heads after you harvest the main head of broccoli. Make sure the flower buds are still closed. If the plant has bolted (is flowering), it’s too late to pick it.